Ohio Celebrates a Momentous Victory on Issue 1! 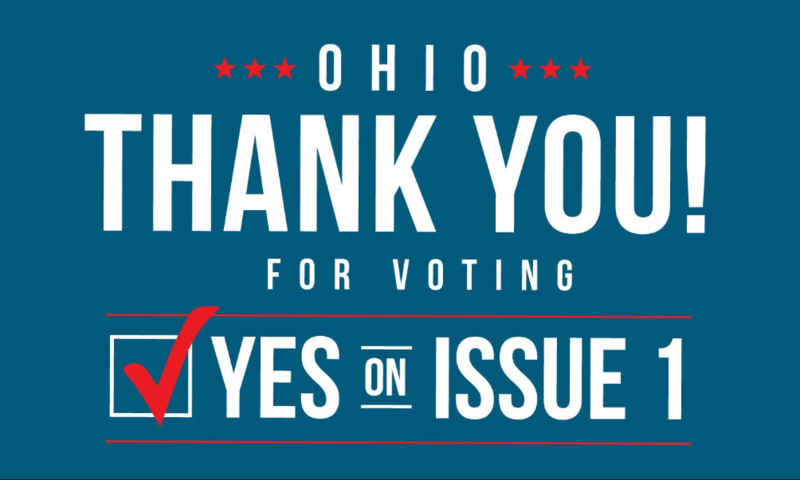 On Tuesday, May 8, Ohioans did something amazing! Thanks to dedicated volunteers across the state, Issue 1 passed with over 74% of the vote! This constitutional amendment will stop the practice of gerrymandering our congressional districts, and will require a process of drawing our districts that is both fair and bipartisan. In a time of great division, Issue 1 brought people together. The Ohio Democratic Party and the Ohio Republican Party both endorsed Issue 1. Ohioans from all walks of life agreed the manipulation of our district lines was bad for our democracy and needed to end. Now, Ohio will have a bipartisan mapmaking process with plenty of public participation to ensure our districts are drawn fairly. The Ohio Environmental Council, the League of Women Voters, and Common Cause Ohio endorsed Issue 1 from the beginning, because it meant keeping communities together and empowering voters. In fact, the OEC was at the negotiating table for days to bring Issue 1 to the ballot. We went all in on Issue 1, because most Ohioans want access to beautiful public lands, care about the safety of their drinking water, and want to make sure their communities are clean and beautiful. Because of the passage of Issue 1, our congressional representatives will soon truly represent the people, and the environment will win! We are incredibly grateful to the many volunteers who committed to collecting signatures in order to bring lawmakers to the negotiating table and ultimately secure this issue on the May ballot. Without the support of volunteers across the state and the incredible leadership of our partners, we couldn’t be celebrating victory today. We’re excited to help usher in a new era of bipartisanship in our democracy, and we promise to continue to fight for representatives and policies that put the environment and health of Ohio families first.